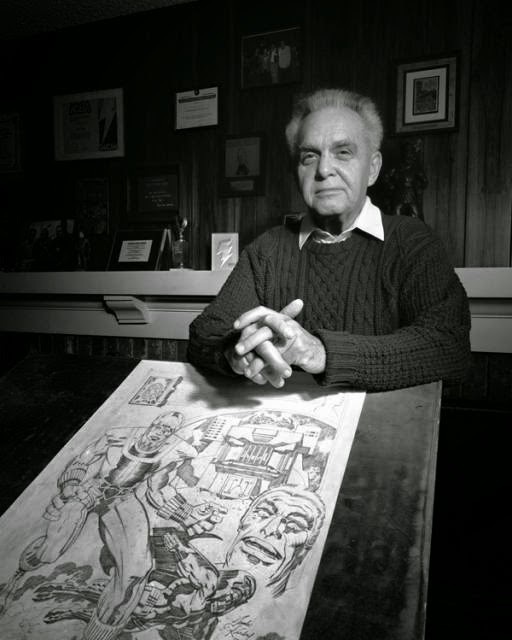 Photo of Jack Kirby via ComicVine. Just a few days before the Kirby v. Marvel case was scheduled to be considered by the Supreme Court, both parties settled, out of court. This was unexpected and it sure feels good to write that compensation (and, I hope, credit on the movies) is on its way to the Kirby heirs. The details, as things are in cases like this, were not disclosed. But, since Jack Kirby was the creator or co-creator of many prominent characters (Captain America, Iron-Man, The Avengers, "Groot" from Guardians of the Galaxy, the Fantastic Four, and many, many more), his family sure deserve to share in their spectacular financial success, which have earned Marvel and its parent company billions of dollars. Marvel always held that Kirby worked without a contract, that they had a work-for-hire relationship and that they (Marvel) owned 100% of what he did. And, legally, Kirby was not entitled to another penny. I would have to believe that the offer is generous and placates the family's well placed feelings of injustice to this seminal, creative genius who died 20 years ago. Much more at Deadline Hollywood.